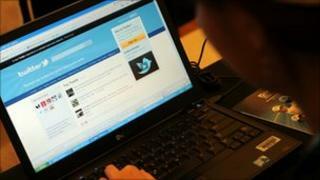 A woman in China has been sentenced to a year in a labour camp after posting a message on the social networking website Twitter. She had repeated a Twitter comment urging nationalist protesters to smash Japan's pavilion at the Shanghai Expo, adding the words "Charge, angry youth". However, many people use it by circumventing internet controls. The offending online "tweet", which has landed 46-year-old Cheng Jianping with a year of re-education through labour, was posted in the middle of last month. At the time, China and Japan were embroiled in their worst diplomatic row in recent years over a group of uninhabited, but disputed, islands in the East China Sea. Groups of young Chinese had been demonstrating against Japan, publicly smashing Japanese products. Cheng Jianping's fiance, Hua Chunhui, told the BBC he first posted the short message on Twitter, ridiculing the demonstrators, saying their actions were nothing new and if they really wanted to make an impact they should smash the Japanese Pavilion at the Shanghai Expo. Ms Cheng then "retweeted" the mocking message, he said, forwarding it and adding the words "charge, angry youth". Ten days later she was detained by police "for disrupting social order" and has now been sent to the Shibali River women's labour camp in Zhengzhou city in Henan Province. Mr Hua said his fiance had started a hunger strike and he was trying to get her released to undergo her re-education at home. Contacted by the BBC, staff at the camp said they had no information to give. But Mr Hua said documents from the labour re-education committee made it clear Ms Cheng had been committed because of her single "tweet". Another Twitter user has now tweeted that Ms Cheng should apply for a place in the Guinness Book of World Records, because the five words she added to the message had cost her a year of freedom. Her detention is a sign of how closely China's government scrutinises comment on the internet. The authorities are fearful of the power of the internet to stir up discontent. They are also wary of the way nationalist demonstrations like those targeting Japan have the potential to run out of control. Ms Cheng may also have been targeted because she is a local human rights activist. Her fiance said she had signed petitions including one calling for the release of China's jailed Nobel Peace Prize winner Liu Xiaobo. And she had been detained by police for five days in August this year after she voiced support for Liu Xianbin, a long-time campaigner for democracy in China, involved in the protests that preceded the Tiananmen Square massacre in 1989. Liu Xianbin had been detained again this year, apparently suspected of inciting subversion of state power for criticising China's Communist Party.